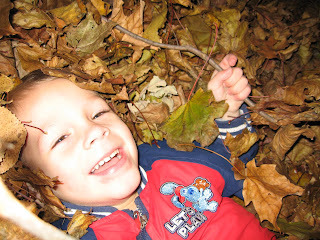 Fun with the leaves! Today we went outside to pretend to rake the leaves. I ended up making a big pile for you, Sara and I to jump in. What fun! You are a pretty flexible kid. You go with the flow, and just want to be around others. Lately you are having strong feelings when you want something. When you see something you want - you yell "ahh - me, ahh - me!" stating, that's for you! What a cutie you are. I love you "Ei" (you no longer call your self "me" you now call yourself "Ei" ) Love, Mommy.